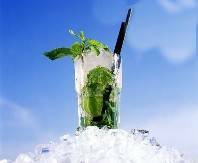 Behind a marketing push by Bacardi the mojito is swinging into the mainstream and Craig LaBan takes a look at them at Copa Miami. Copa uses sugar cane as swizzle sticks for its top-shelf mojitos, which now come in apple, orange-mango and watermelon. Some use flavored rum; some get a splash of fruit puree. Curry says his bartenders are working on a mojito topped with champagne, sort of like a Bellini, for its forthcoming Sunday brunch. Another variation – called Miami Spice – will use spiced rum.